When some of the nation’s top scholars decided to pen a book examining the life of Dr. Melvin C. Terrell and his contributions to the field of student affairs, Terrell knew that was something special. But then again, the life of the former Vice President for Student Affairs and Professor of Counselor Education at Northeastern Illinois University has been nothing short of extraordinary, which is why in retirement, he’s become the subject of a new Festschrift — “a time-honored academic tradition that recognizes the retirement of a noted and celebrated scholar by other scholars contributing original work to a volume dedicated to the honoree,” says Dr. Jerlando F. L. Jackson, one of the co-editors of Advancing Equity and Diversity in Student Affairs, the Festschrift in honor of Terrell that was released late last year. Indeed, Terrell, who retired in 2008 at the age of 59 after a 20-year tenure as Vice President for Student Affairs at NIU — the longest tenure for an African-American in that position at a predominantly White institution — is seen as an academic giant, a walking model for how colleges and universities should approach equity and diversity work in student affairs. Even during his tenure at NIU, Terrell simultaneously was a full professor in counselor education while serving as vice president for student affairs. Growing up on the west side of Chicago, Terrell’s parents — Cleveland and Ethel Lee — emphasized the importance of education for their six children: Lawrence, Doris, Eugene, Carol, Francine and Melvin, who was the eldest. “In the household, I was a serious student, even as a youth,” recalls Terrell, who remembers rising around 4 a.m. every morning to study because the house was quiet. After attending Catholic elementary and high school, Terrell matriculated into Chicago State University, where he completed his undergraduate degree in two years and ten months. After he graduated with a degree in history, he taught seventh-grade social studies at an inner-city elementary school in Chicago for a year and then went on to enroll in a master’s program at Loyola University Chicago with a focus in higher education administration. Later, he enrolled in a doctoral program at Southern Illinois University at Carbondale, earning his degree at the age of 28. Terrell made a seamless tradition into academia, working in a variety of positions ranging from coordinator/counselor of Black affairs to director of academic success, to director of learning development at a variety of institutions across the nation. After stepping down as the director of Minority Affairs at the University of Toledo, Terrell was named vice president for student affairs at NIU and had oversight over dozens of departments and programs, including athletics. When he wasn’t working at his administrative job, Terrell was active in professional organizations like NASPA and NASAP — two national associations for student affairs personnel. He was also churning out peer-reviewed articles and co-authoring books with his contemporaries and his protégés, such as How Minority Students Experience College: Implications for Planning and Policy and Enhancing Student Learning: Setting the Campus Context. Jackson and his co-editors, Drs. Lavar J. Charleston and Cornelius K. Gilbert, say that as college administrators grapple with the myriad of problems from student unrest to free speech issues on campus, they would be wise to study the work of Terrell. They say that the book serves two foci. 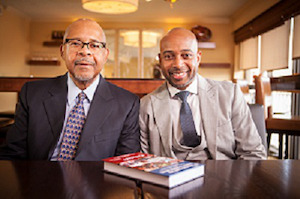 Dr. Shaun R. Harper, the Clifford and Betty Allen Professor of Education and director of the Center of Race and Equity at the University of Southern California, said the book is a must-read for those interested in pursuing the equity and diversity lens in student affairs and helping to move the needle. Harper recalled meeting Terrell as a sophomore in college at a NASAP conference and was amazed by how accessible he was. “In many ways, having access to a role model of his caliber during the formative years of my career is something that I’ll always appreciate and be indebted to him for,” says Harper. Others tell similar stories about his mentoring across the years and point to Terrell as someone who singlehandedly reshaped the director of student affairs role that allowed more practitioners of color and researchers of color to follow behind. Terrell, who exercises at least six days a week, spends much of his time traveling internationally, reading and attending the theater and museums. He also runs a foundation in his name, which raises funds for minority graduate students. Still, he remains appreciative that his body of work has been memorialized in a 438-page text. This article appeared in the June 28 issue of Diverse magazine.